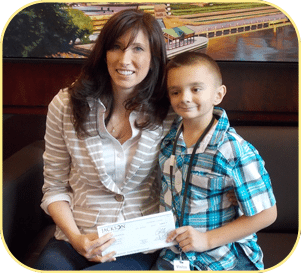 Gabe’s Chemo Duck Program recently received its first grant from the Jackson National Community Fund (JNCF). The award will allow the program to complete the second installment of the Chemo Duck Cartoon. Jackson National Life Insurance, founded in 1961, is one of the nation’s largest insurance companies. Through the JNCF, Jackson and its employees invest in the communities in which they live. With corporate headquarters in Lansing, Michigan, Jackson also has offices in Denver, Chicago and Nashville. According to Corinne Bergeron, corporate social responsibility manger for Jackson Insurance in Nashville, the company’s donations and sponsorships are directed to organizations, programs and events dedicated to enhancing the lives of children and the elderly. “The Chemo Duck program was one of 20 applications our executive committee reviewed,” said Bergeron. “With a focus of helping children confronting a disease like cancer, any role our company could play to support them was the main driver in awarding the grant. The $5,000 grant is one example of how Jackson Insurance is working to participate in projects and initiatives that strengthen the communities in which they work and serve, said Bergeron. Sipos said she is looking forward to other ways to partner with the company in hopes of bringing Chemo Ducks to patients in the areas the insurance company has a presence.